This episode Watson, Jessica, Valerie and I talk reading resolutions for 2017 and what we're "Geeking Out" about at the moment. 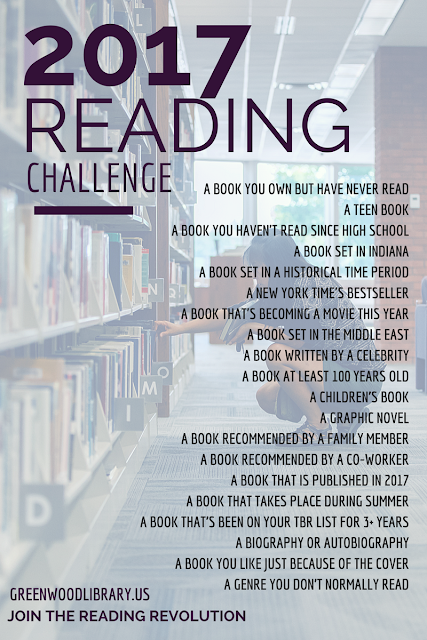 This year our library staff is participating in a reading challenge, encouraging each other to read widely and share what we're reading. This is the first of many conversation starters in a "Reading Revolution", a concerted effort to champion literacy and make talking about books and reading a priority in our community. Because reading is cool. The challenge is pretty easy. Pick a book - any book - that fits into one of the categories listed below. Challenge yourself to select titles outside of your reading comfort zone. Explore new genres, new authors, and new formats. Then share what you're reading! Tell a family member, librarian, or neighbor all about what you're reading. Be a part of the conversation! You should totally join us!